I have never been a patient person – you can ask my family, friends, and probably even acquaintances, and they’ll all tell you the same thing. Why? Usually I don’t want to wait for good things to happen…I want them now. Unfortunately, I’ve lived with this my whole life. Since I was a regular old toddler, I wanted to be on my schedule and mine only. Growing up mostly with a single father will do this to you. Spending 75% of your time in a testosterone filled household with a father who works can do something to a kid. Its what I became used to…doing things aggressively and when I wanted too, well, because that’s what dad did and that’s what I knew. There have been many points in life where this has been used for my benefit, such as my short-lived sports career, and there has been times where it does nothing but mentally destroy me. I am not depressed and I am grateful for that everyday as I’ve seen what it can do to people, however, certain things can cause any individual mental stress. Well screw off, I want to see my Vikings beat your Patriots in the Super bowl now, I want to see my niece Ava grow into a beautiful woman and my brother to grow up to be a stud…I want to see that now. I want some one to do something about ISIS, I want the refugee crisis to be controlled so that thousands of desperate people don’t die. I want my friends to figure their life out because it contributes to mine more than they know. And I want consistent happiness. I want it now. "I want it all, I want it all, I want it all, and I want it now", said Freddie Mercury. What’s so wrong with wanting now instead of tomorrow? I've learned that sometimes it just isn't possible right now. The Vikings need to figure out their offensive line situation, my brother and Ava still have a decade of childhood memories to fill, big shot politicians need to take a much more unified and aggressive stand against ISIS as well as figuring out ways to aid the refugee crisis. Once all this happens, if it ever does, it's a good thing. And you know what? Good things take time no matter how soon I want to change it. Still, I leave behind friends for a whole semester, and that scares me. This word "friend" means something a lot more now than it ever has in my life. While there is no question I will take full advantage of my time overseas, making new friends and seeing the world, there is also no doubt that I will constantly think about my group of friends back at Saint Michaels College. They mean far too much to me to just "forget" about for a few months. 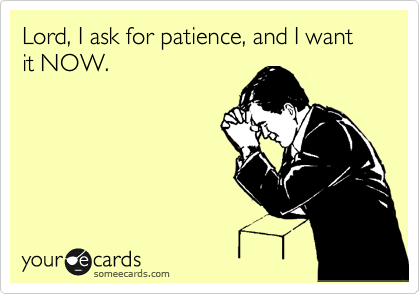 So my patience will be tested again and I already know it - question is how I will tackle it. I can be patient, just remember that if possible “I'd want it all and I'd want it now” (thanks Freddie, love the lyric). But I've realized the best of things take patience because well, having things handed to you is far to easy. The parts of life that are tough, stressful, and time consuming yield the most rewarding results and I intend to be apart of those results for the rest of my life, starting now, even if it means I have to change.